If you follow me on Twitter (twitter.com/mtgcolorpie), you knew that I was at the Zendikar pre-release in Seattle. And you also know I met Mark Rosewater (or MaRo for the uninitiated) who is kind of a big deal (he smells of rich mahogany). Let me say that (mono-tone voice) Mark Rosewater is the smartest man alive. He can do no wrong. You are unable to stop him and his tyrannical reign upon Magic. (Yelling, shaking head violently) Ah, free from that mind control serum he gave me. I’m on to you sir. We were having a conversation with Brian Tinsman (another high-profile R&D member) and another player (sorry, I forgot your name). And out of this conversation, I learned some things about Mr. “I’m the face of Magic to the internet crowd.” I’m willing to share these things with you, out of the goodness of my heart. Plus, if you ever meet him either at an event or somewhere else, you can have a hand up on him. 1. He reads all his tweets, e-mails and threads. This isn’t something he says, he actually does it. He really wants to know what you’re thinking. Sometimes when there’s a controversial topic he’s going to talk about (Mythic Rares) he knows he’s going to get people pissed off. 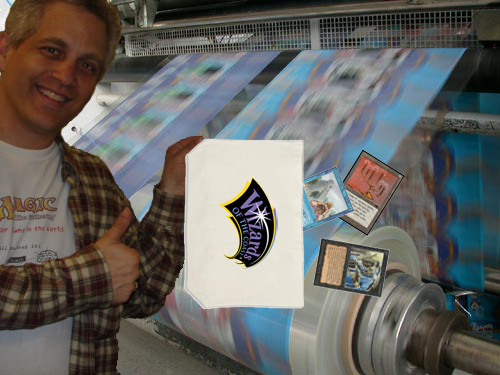 Thinking that there’s a certain group of players out there who hates everything he does, MaRo knows he’s going to get that mail. He has yet to name said demographic (may I suggest a Jason, who created the much beloved Web Comic “UGMadness” and his character Fanboy). If you want to tell him how you’re feeling about something, do e-mail or tweet him (twitter.com/maro254). 2. Four young children walk ahead of MaRo ripping up Power 9 cards so his feet never touch the ground. After he walks by two more children walk after him to clean up the ripped up cards so that no one can use them again. 3.Mark Rosewater is a time traveler. Alright, not really, but he’s living two years in the future. He’s already passed off the 2011 design to development (Code named “Shake” from “Shake, Rattle, Roll”). He’s bored of talk about Zendikar as it is two years old. Alright, not bored, but finally able to talk to people outside of Wizards about it. He also knows what the series finale of Lost is and knows who wins the next two Super Bowls. 4. I don’t know if you’ve heard about this, but Mark Rosewater used to work for Roseanne. 5. He wants me to state that Magic is doing just fine, both design wise and money wise. While some promotions *cough* Priceless Treasures *cough* and some releases (The upcoming Slivers and Garruk vs. Lillana decks) might point otherwise to some, that’s not the case. The reason those exist is now Wizards has options to sell stuff to different demographics since they’ve printed so many cards. Magic is alot of things to alot of people and they want all those people to be happy. Seriously, Wizards is making money. In fact, MaRo laughed while he said this, and took out a hundred dollar bill and blew his nose on it. 6. Give him a pack, and just by reading the tracking code, he can tell you what the pack entails. It’s a fun party trick. 7. He does it all for the ladies (Note: Mrs. Rosewater if you ever read this, he only does it for you). 8. The last time MaRo used a metaphor to explain how he believes how the public sees something, there was complete backlash. Let’s see if I can do a little better. Apparently people are complaining that Wizards is trying to “dumb down Magic.” The removal of mana burn, damage on the stack, etc. All of this is to make it easier for new players to learn and make the game less complex. MaRo used a fire as an example of the complexity of Magic. He thinks players think that magic is a little campfire, where you have to shield it from any gust of wind or it will go out (you change anything and the whole game goes bye bye). Wizards, on the other hand, sees it as a four alarm fire; there’s so much stuff going on that one small thing isn’t going to make a different. I agree with MaRo here. No, I’m not still under mind control or a complete fanboy. Have you ever tried explaining Magic to anyone? How to start, what you do, when you do things? The game is already complex; compared to one of my other favorite games Fluxx, Magic has a very steep learning curve but rewards people who continue to play it. By removing small things like mana burn and combat damage, it’s not ruining the game. Sure, there was outcry at first but then you get used to it (Personally, I wished mana burn was still in the game because it’s flavorful and it makes the player make tougher decisions. I understand why they took it out, but I still miss it). 9. Don’t mention Licids to him. It makes him angry. You wouldn’t like him when he’s angry. 10. If you see him, say hi. He’s really friendly and he’ll talk your ear off. He’ll argue with you about why Wizards did something and try to convince you that he’s in the right (truth be told, he’s right most of the time, just like my wife). Just, don’t be nervous. Go up there, be polite, and talk to him. Was I nervous? Sure, because I put myself out there a little bit (like my new favorite photoshop ever) where he can see it and I didn’t know how he’d react completely. Luckily, after begging for my life, he released the Force Choke on me and allow me to live. Join me next time where I write something with words and letters. Maybe even a picture or two. You know what, you guys have been good. I’ll do a picture of something.